Rural America is "becoming less and less relevant," and that's one reason a new Farm Bill hasn't become law, Agriculture Secretary Tom Vilsack said at a Farm Journal Forum in Washington Thursday. "A month after an election that Democrats won even as rural parts of the country voted overwhelmingly Republican, the former Democratic governor of Iowa told farm-belt leaders this past week that he's frustrated with their internecine squabbles and says they need to be more strategic in picking their political fights," Mary Clare Jalonick of The Associated Press reports. "He said rural America's biggest assets — the food supply, recreational areas and energy, for example — can be overlooked by people elsewhere as the U.S. population shifts more to cities, their suburbs and exurbs." The nation's rural population is at an all-time low, 16 percent, and that's one reason the Farm Bill has stalled in the House, Vilsack said, not just because of policy disagreements among the House, Senate and House Republicans. "Rural America with a shrinking population is becoming less and less relevant to the politics of this country," Vilsack said, "and we had better recognize that and we better begin to reverse it." Jalonick notes that exit polls found that rural voters accounted for only 14 percent of those in last month's elections. Vilsack said broader rural interests have suffered as farm lobbies have stirred unnecessary umbrage over false issues such as the Obama administration's supposed intention to regulate farm dust. "We need a proactive message, not a reactive message," he said. "How are you going to encourage young people to want to be involved in rural America or farming if you don't have a proactive message? Because you are competing against the world now." 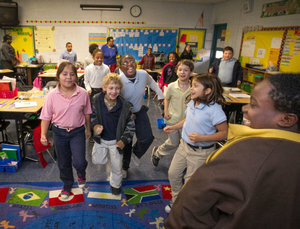 classes start at Bells Elementary. With nearly two-thirds of South Carolina deemed overweight or worse, lucky Colleton County got picked to be a test case for doing better. That is, for improving its chances to beat the state's already overwhelming rates of diabetes, heart disease and stroke and for helping to lower the state's $1.2 billion dollar medical bill. Lucky, because in 2010, the county was awarded almost a half million "Eat Smart, Move More" grant by the BlueCross BlueShield of South Carolina Foundation to see if it could promote health eating and more physical exercise countywide. Joey Holleman of The State newspaper in Columbia reports "The results have been striking," though he notes that changing obesity numbers is "like turning an aircraft carrier; it's a slow process." Mostly, he's talking about attitude and perseverance. How does the countywide program work on a daily basis? First, of course, you have to have buy-in. Hollerman explains that now when children arrive at Bells Elementary School in the county seat of Walterboro, "They go straight to the gym and walk laps before heading to classrooms. Worshipers at Power of Faith Delivery Ministry harvest collards as well as souls, and fried chicken is discouraged at church dinners. The local farmers market has a sparkling new home and a system set up to accept cards from the Supplemental Nutrition Assistance Program," formerly known as food stamps. The "Let’s Go, Eat Smart" program and exercise programs are posted in schools, workplaces, grocery stores and churches. So, if the numbers aren't clear yet, how to measure impact? Well, a recent church supper had only one fried-chicken basket, and the member who brought it ended up apologizing for her breach. On the day the reporter visited only the elementary school only one child in the first grade tried to slip through without selecting a fruit or vegetable. He was sent back and grabbed a plastic container of grapes from the Go (instead of the Slow or Whoa) food options, Hollerman reports. There are also anecdotes galore, including those of children no longer on insulin. After seeing a few promotional snippets, U.S. Sen. Joe Manchin of West Virginia is objecting to the latest rural reality show, one set about 15 miles north of the state Capitol where he was governor. 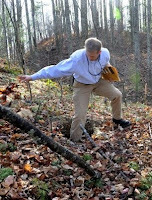 "Buckwild," which premieres Jan. 3 at 10 p.m. ET on MTV, follows nine young adults in and around Sissonville, just off Interstate 77 north of Charleston. 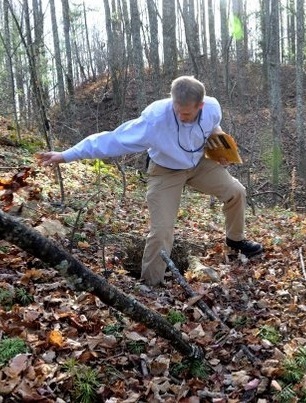 It will replace "Jersey Shore" and has been dubbed "the 'Jersey Shore' of Appalachia" by ABC News. The show features "a lot of riding down hills inside giant tires, driving trucks dangerously through mud, tearing up the trails on ATVs and motorcycles, drinking, body licking, fighting with neighbors, and doing 'Jackass'-y stunts," Dan Snierson of Entertainment Weekly writes. "They represent an exaggerated image of the lives of rural people who deal with their hands," Ted Ownby, a Southern-studies specialist at the University of Mississippi, told ABC's Paula Farris. The show's executive producer, John Stevens, told Lynette Rice of Entertainment Weekly that the show “celebrates” the six women and three men, and predicted that viewers will “watch the show and wish they could be them.” He added, “It’s not like looking at a train wreck.” For more from The Washington Post, click here. Tired of all the back-and-forth about "the fiscal cliff" and wondering what it really means, especially to your rural community? Agricultural policy specialist Aleta Botts, left, of the University of Kentucky explains the basics and gives some examples in an article for the Daily Yonder and The Rural Blog. "Many rural development programs (rural housing, electric, and community facilities) lose 8.2 percent of their budgets under the automatic cut," she writes. "You have probably driven by a sign in a rural community with the USDA logo about upcoming construction or renovation. These programs build libraries, lay pipe for new water systems, help build new houses, and support many other projects that mean that rural communities have a higher quality of life; they also mean jobs for the people working on those projects. Under an automatic budget cut set to occur on Jan. 1, less funding is available for those types of projects." 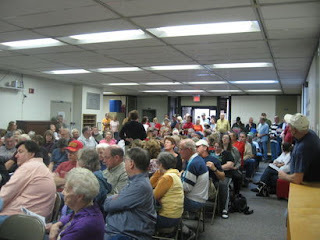 USPS meeting about the post office in Great Cacapon, W.Va.
Just when you thought rural communities had no further recourse than to sit still while their post offices closed, here comes a West Virginian with a fresh idea. Keith DeBlasio, who admittedly hadn't been paying a whole lot of attention to the post-office mess, went to a local meeting about the office in Great Cacapon. The Postal Service proposed to cut the office to six hours a day next month, and DeBlasio decided he didn't think the customer survey he was handed actually gave him any real choice. (Save The Post Office notes that the survey says "customers must choose between having the window hours reduced or having the office undergo a discontinuance study, but it is clear that the study can lead to only one outcome -- a Final Determination to close the office.") So by making the outcome a done deal, figured DeBlasio, "the Postal Service turns a discontinuance study into an empty gesture and abrogates its responsibilities under Title 39." The AdvoCare complaint is here; the Postal Service’s motion to dismiss the complaint is here, and AdvoCare’s response to the motion is here. The National Rural Health Association this week urged a wholesale re-education of Congress on the issues facing rural America's hospitals and providers and the patients they serve. David Lee, government affairs and policy manager for the association, writes in the Daily Yonder that now is the time for a Congress that has not shown much interest or understanding of rural health issues to understand the long-term significance of its action or its inaction. Already, Lee notes, three payments for rural hospitals have been allowed to expire: the Medicare Dependent Hospital program, the Low-Volume Hospital Adjustment and the Section 508 or hospital wage index programs. Together, he writes, these programs "provide millions of dollars in reimbursements to rural hospitals treating specific Medicare populations. Unless these payments are restored, many hospitals will likely have to reduce services and staff to stay afloat." There is more to come, he fears, if legislators use rural-health program dollars to make up for other spending or budget cuts. Lee sees a likely target in the appropriations for Area Health Education Centers (map), which he says have consistently been below authorized spending allowances. AHECs are necessary, he argues, to counteract doctor shortages in rural America. A federal agency has suspended $100 million in funding for a quasi-governmental Internet service provider " amid operational concerns and criticism that it was building redundant fiber optic lines in Colorado," Jeremy Jojota of KUSA-TV in Denver reports. Eagle-Net was getting the money from the National Telecommunications and Information Administration to run fiber to "underserved communities throughout Colorado." The University of Texas said today that it has accepted the highly critical findings of an independent review of a recent report on potential impacts of shale-gas drilling and hydraulic fracturing by the school’s Energy Institute. Andrew C. Revkin of The New York Times reports that the review did not expressly question the quality of the study, but did have serious problems with lead investigator Dr. Chip Groat's lack of transparency about the study's funding. Groat has reportedly received more than $400,000 in compensation from a shale-gas development corporation of which he was a director and owned more than $1 million in stock. Groat retired last month and the institute’s director, Raymond Orbach, has resigned. The school said it has withdrawn from the Energy Institute’s website documents related to the report and will submit them for fresh review by experts. (Read more) To read Revkin's earlier reporting about the matter, go here. Urine from livestock treated with antibiotics contributes to antibiotic resistance in humans, according to a Washington State University study. 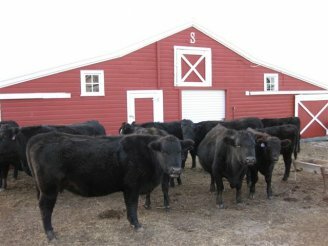 The findings come just seven months after the Food and Drug Administration issued new rules limiting use of the antibiotic cephalosporin in cattle, pigs, chickens and turkeys because of concerns that it might cause failure of life-saving antibiotics in humans, notes Michael Fielding of Meatingplace, a journal for the meat industry. "Even short-term persistence in soil provides an advantage to resistant E. coli populations, resulting in significantly prolonged persistence of these bacteria in the soil," researchers say in the study, published in the journal Plos One this month. They found that a variety of bacteria may develop resistance within 24 hours, including E. coli and salmonella, especially in warm weather. antibiotic cephalosporins are used to treat salmonella and shigella, mostly in children. Gun sales hit record levels after Obama was elected in 2008, even though didn't call for additional restrictions in his first campaign. Sales jumped again after his re-election, as many gun advocates and owners peddled fears that he would limit their right to bear arms. Gun-control proponents told Hughes they hope their efforts will gain more support after the movie-theater shooting in Aurora, Colo. last summer and the murder-suicide involving a professional football player last week. A record number of rural hospitals have been included on a prestigious, nonprofit health-care organization's annual Top Hospitals List. The Leapfrog Group's list is "the most competitive national hospital quality award in the country," and "recognizes hospitals that deliver the highest quality of care by preventing medical errors, reducing mortality for high-risk procedures, and reducing hospital readmissions," a press release says. Thirteen rural hospitals made this year's list of 92. The Leapfrog Hospital Survey says it is one of the most rigorous such surveys, and provides a complete picture of a hospital's safety, quality and use of resources. 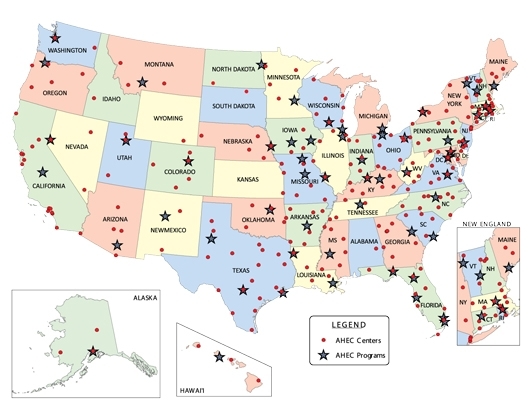 The 13 rural hospitals are in Florida, Iowa, Illinois, Massachusetts, Maine, Michigan, Pennsylvania, South Carolina and Tennessee. More beef cattle will be located in drier regions of the country in the future because they are becoming less numerous in regions where land use is increasingly shifting from pasture to crops, a livestock marketing specialist says. The increased demand for corn that starting in 2006 culminated in this summer's drought, during which prices rose sharply. Derrell Peel of Oklahoma State University says higher demand has led to "intense competition among crops for land resources." The "epicenter of this crop frenzy" is in the Midwest, reflected by the jump in land values in the region, Peel writes. He acknowledges that data are limited, but says there are long-term impacts of this type of land use, and there are "strong indications" that they have already started and will have a major impact on the beef industry. There are 171 million acres of pasture and hay land that are arable, according to the 2007 National Resources Inventory. Peel says that converting those acres to cropland isn't easy or quick, but high crop prices "will logically attract some of these acres for cultivated crop production over time." 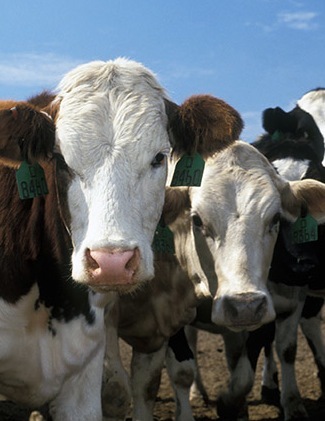 Changes in cattle inventories lead Peel to believe that the expected trend has begun. The U.S. beef cattle herd has decreased by 2.8 million head, or 8.5 percent, since 2007. The decrease is more pronounced in the Midwest and surrounding states, including Illinois, Indiana, Iowa, Minnesota, Missouri, Kentucky and Tennessee, Peel writes. Twelve Great Plains and Rocky Mountain states experienced increases or very small decreases, from 5 percent increase to 7.5 percent decrease. Those figures "indicate that the beef cow herd is decreasing more rapidly in regions where competition with crops is greater," Peel writes. 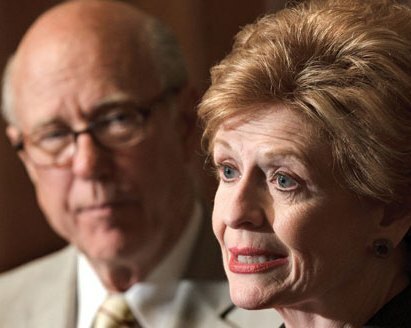 In a move that puts him at odds with House Republican leaders, Pat Roberts of Kansas, top Republican on the Senate Agriculture Committee, told Agri-Pulse that he now supports Senate-passed version of the Farm Bill, and is working with Committee Chair Debbie Stabenow, D-Mich., to get it passed as part of any "fiscal cliff" resolution. "We hope that we can see a train there on the other side of the tunnel," Roberts told the Washington newsletter. "Anything that moves, that needs money, obviously here's the way to do it." The Farm Bill has been in place since the 1930s, and has sustained farmers through fluctuations in commodity prices, yields and weather. Every five years commodity groups, representing growers of rice, soybeans, wheat, cotton, peanuts and corn, lobby Congress for support. But this year, the bill is stuck "in no-man's land as the budget-and-tax war rages on Capitol Hill," Dan Freedman of the San Antonio Express-News writes. The fight over the Farm Bill is causing "fissures among conservative Republicans," Freedman writes. Tea Party advocates see the bill as violating conservative and free market principles, spending too much on food stamps; House Speaker John Boehner has said it contains "Soviet-style" provisions on dairy subsidies. But farm-state Republicans "see Farm Bill spending as a wise investment in the rural economy and U.S. food security," Freedman writes. Expert sources on the House and Senate version of the bill told Agri-Pulse it wouldn't be hard to mesh the two versions, but Roberts said last year he wasn't a fan of the Senate version. "Roberts seemed to express a more conciliatory tone during a meeting between Agriculture Secretary Tom Vilsack, Stabenow, [House Ag Committee Chairman] Frank Lucas and House Ag Committee ranking member Collin Peterson last week, when he said the group reviewed Farm Bill challenges without negotiating any specific provisions," Agri-Pulse reports. Agri-Pulse is available by subscription only, but a free trial can be accessed here. 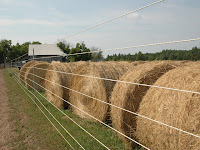 Severe drought has decreased hay production, increasing hay's price. Farmers were forced to buy it to feed livestock this summer as the price of feed corn skyrocketed. Now higher prices have led to an increase in hay theft, from Maine to California. In Tillman County, Oklahoma, Sheriff Bobby Whittington is using technology to fight hay thieves. He bought a portable global-positioning-system unit, and put it in a bale on a farm where hay had been stolen earlier this year. Four weeks later, a message was sent to his cell phone in the middle of the night telling him the bale had been taken. He followed the trail with the help of real-time computer tracking, and found the thieves as they were unloading their haul. He arrested them back at the farm where they stole the hay as they were loading another bale. They face felony charges of concealing stolen property, which carries a possible sentence of three to five years in jail. These thefts are on the rise across the country, and Mark Memmott of NPR has rounded up some hay theft stories from across the country here. Officials and law enforcement in Appalachian states have been cracking down on the prescription pain-pill drug trade for years. They've created electronic prescription-tracking systems, restricted prescribers, staked out pain management clinics and shut down a drug pipeline that started in Florida. It's all been done to curb the pain-pill epidemic that recently surpassed car accidents as the leading cause of death in the nation. But now, just as those efforts were showing signs of paying off, an old, familiar drug has made a resurgence: heroin. 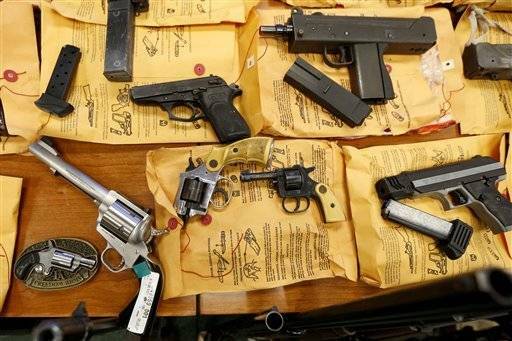 "There's always some type of drug to step up when another gets taken out," Dan Smoot, law enforcement director of Operation UNITE, which handles drug investigations in 29 Eastern Kentucky counties, told Brett Barrouquere of The Associated Press. "We didn't know it was going to be heroin. We knew something was going to replace pills." Officials say the heroin is trafficked from Mexico into the U.S., where it first goes to Illinois, Michigan and Ohio. Northern Kentucky counties have been the epicenter of heroin abuse in the state, but law enforcement officials in Louisville, Lexington and Appalachian counties are reporting "a dramatic rise in the number of arrests and seizures related" to heroin. Kentucky State Police seized 11 doses of heroin and other opiates in 2008 in the eastern half of the state; they have seized 395 doses there so far this year. Pharmacies in Missouri have started selling a new version of a popular decongestant, one that can't be used to make methamphetamine. Pseudoephedirne, a key ingredient in meth, crystallizes when heated, a key process in making the illegal drug. The new form of pseudoephedrine, Zephrex-D, turns to goo when heated, making it impossible to use for meth production. Missouri has been hit hard by the meth epidemic, which is mostly concentrated in rural areas. The state has led the U.S. in meth-lab busts in all but one year since 2003, Jim Salter of The Associated Press reports. Zephrex-D is on sale in pharmacies in St. Louis, and in Walmart stores in other Missouri towns. Freshly re-elected, Mo. congresswoman quitting to head National Rural Electric Cooperative Assn. Jo Ann Emerson, 62, just got re-elected to Congress from Missouri, but she is quitting Feb. 8 to be CEO of her main campaign contributor, the lobby for rural electric cooperatives and local public power agencies. "Colleagues and congressional analysts expressed surprise and dismay," reports Dave Heller of the Kansas City Star. "It wasn’t immediately clear why Emerson waited until just after the November election to make her decision" to join the National Rural Electric Cooperative Association. The Republican from Cape Girardeau said, “I did not go seeking this opportunity, but I am excited about the new challenge it offers to find ways to promote strong rural policy.” She told reporters that she made the decision quickly, reports Erin Ragan of the Southeast Missourian. "Emerson’s office said that negotiations for her new job began Nov. 19, after the election," reports Morgan Little of the Los Angeles Times. "House ethics guidelines on what sorts of negotiations for post-congressional employment are permitted are nebulous." Emerson declined to say what her new, higher salary would be, but her predecessor made $1.9 million last year, notes Bill Lambrecht of the St. Louis Post-Dispatch. She will be the fourth former House member to head NRECA, Agri-Pulse notes. The Post-Dispatch said in an editorial, "Despite Ms. Emerson’s claims to the contrary, it defies reason that this job invented itself out of thin air less than a month after she won re-election. Ms. Emerson’s elevation to the role currently held by Glenn English, himself a former Democratic congressman from Oklahoma, was rumored not long after Mr. English last year announced his intention to retire." The paper noted that it had endorsed Emerson partly because she is a moderate, but then stuck it to her: "Her decision to cynically run for a post in which she never intended to serve diminishes an otherwise reasonable legacy. Ms. Emerson may well be a tremendous choice to represent rural electric cooperatives in the nation’s capital. But for now, she’s Exhibit A in the ongoing saga of why Congress has fallen to its lowest point in history in terms of its public reputation." Emerson succeeded her husband, Bill, a 13-term representative who died in 1996. She was "considered one of the most moderate members of the Republican caucus," Heller notes. "Her departure reflects the continued polarization of the House, some observers said." (Read more) "She was a co-chairwoman of the Center Aisle Caucus, a group of House members from both parties who worked to promote cooperation and civil discourse in Congress," Lambrecht notes. 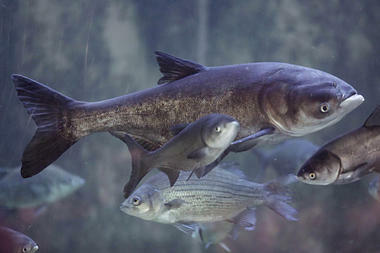 A federal judge has thrown out a lawsuit filed by five states to prevent Asian carp from invading the Great Lakes through Chicago-area canals that lead to the Mississippi River system, but said he would consider new arguments if the states filed another suit. The carp are on the verge of invading the Great Lakes, and scientists say if they are allowed to "gain a foothold," they will outcompete other fish species, and severely damage the region's $7 billion fishing industry, Flesher and Webber report. Control efforts have been largely successful, but it only takes a few breeding carp to close the deal. Michigan, Wisconsin, Minnesota, Ohio and Pennsylvania filed suit, claiming that the U.S. Army Corps of Engineers and Chicago's Metropolitan Water Reclamation District haven't done enough to keep the fish from using canals to enter Lake Michigan. 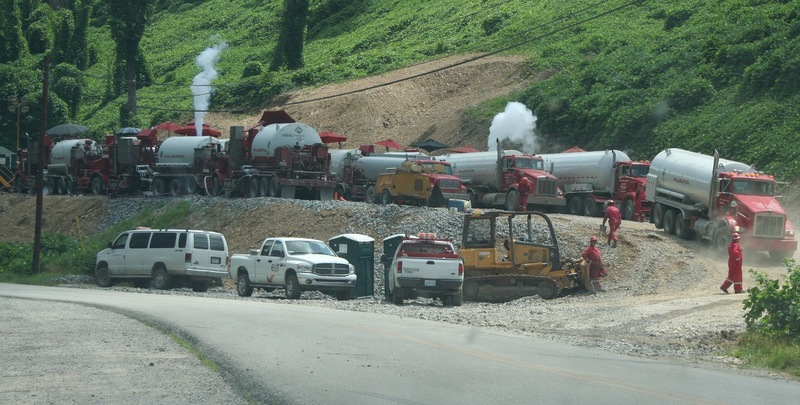 Just as the U.S. Supreme Court was about to hear arguments about stormwater runoff from logging roads, the Environmental Protection Agency issued a rule that could short-circuit the lawsuit or lead to another round of litigation, Lawrence Hurley of Energy & Environment News reports. The EPA rule says logging roads should be exempt from Clean Water Act permitting, but the 9th Circuit Court of Appeals ruled that they should be subject to permitting, and that decision was appealed to the Supreme Court by Oregon, the timber industry and 31 state attorneys general. The circuit court ruled in favor of the Northwest Environmental Defense Center, saying that logging-road operators should be required to apply for National Pollutant Discharge Elimination System permits. That would have broad ramifications, because states now control logging roads and the EPA doesn't require permits. Under the EPA's silvicultural rule, some activities don't require NPDES permits, which regulate point-source pollution. Stormwater runoff on logging roads is considered non-point source pollution. The circuit judges concluded that logging runoff should not be exempted because it is channelized in ditches before being discharged into waterways and is not "natural runoff." The EPA has now created further exemptions that would keep logging runoff exempt, even if it were ruled to be point-source pollution. Veterinarian Michelle Bamberger and Cornell University professor Robert Oswald analyzed 24 case studies of farmers in six states where gas is produced and livestock "experienced neurological, reproductive and acute gastrointestinal problems after being exposed – either accidentally or incidentally – to fracking chemicals in the water or air," Royte writes. The article, published in New Solutions: A Journal of Environmental and Occupational Health Policy, "describes how scores of animals died" over several years, she reports. In New Mexico, hair testing of sick cattle that grazed near well pads found petroleum residue in 54 of 56 cows. In Louisiana, 17 cows died after an hour's exposure to spilled fracking fluid. In Pennsylvania, 140 cattle were exposed to fracking wastewater. About half of them died, and the remainder produced 11 calves, only three of which survived. An overflowing wastewater pit in Pennsylvania sent fracking chemicals into a pond where pregnant cows grazed. Half their calves were stillborn. Study authors say the chemical likely comes from a mix of raw gas that's vented from wells and emissions from industrial equipment used during the fracking process. 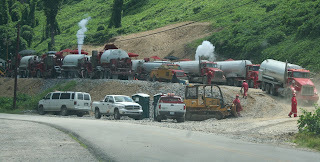 Typically, dozens of trucks containing chemicals are needed to frack a well. Researchers took weekly air samples at a site within a mile of 130 gas wells in Garfield County, Colorado. They detected the chemicals between July 2010 and October 2011, including 44 chemicals that have been shown to affect health. The highest concentrations were measured after new wells were drilled, but concentrations didn't increase as wells were fracked, Song reports. Only Louisville, Lexington and Covington, all in large metropolitan areas, have fairness ordinances. 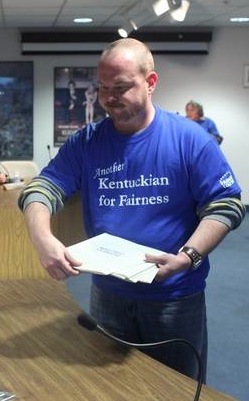 Residents are pushing for passage in Shelbyville, Bowling Green, Richmond, Berea and Elizabethtown. The issue is highl;y controversial; an ordinance in Henderson was repealed less than two years after being implemented, and an ordinance in Berea failed last year, though the council created a human-rights commission. State and local officials often try to attract companies to rural places as an engine for economic growth, but an investigation by The New York Times has found that these officials often spend more to get companies to relocate than their community or town gets in return. The investigation concluded that state, counties and cities spend more than $80 billion every year in incentives to companies, which range from oil and coal companies to banks and big-box retailers, Louise Story reports. Story discovered that it's not possible to get a full account of incentive awards "because the incentives are granted by thousands of government agencies and officials, and many do not know the value of all their awards. Nor do they know if the money was worth it because they rarely track how many jobs are created. Even where officials do track incentives, they acknowledge that it is impossible to know whether the jobs would have been created without the aid," she writes. "A portrait arises of mayors and governors who are desperate to create jobs, outmatched by multinational corporations and short on tools to fact-check what companies tell them. Many of the officials said they feared that companies would move jobs overseas if they did not get subsidies in the United States." The Times investigated more than 150,000 incentive awards and created a searchable database, which can be accessed here. 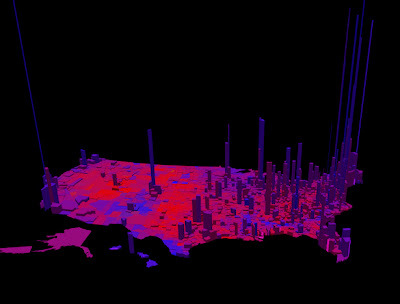 Almost every major city in the U.S. harbors a population with a different worldview than nearby rural places, a trend that has increasinly defines our politics. "The difference is no longer about where people live, it's about how people live: in spread-out, open, low-density privacy; or, amid rough-and-tumble, in-your-face population density and diverse communities that enforce a lower-common denominator of tolerance among inhabitants," Josh Kron writes for The Atlantic. These red-state blue cities can have a big impact on elections. "Because winning a state's electoral votes requires only a simple majority, a single city can change the entire game," Kron reports. 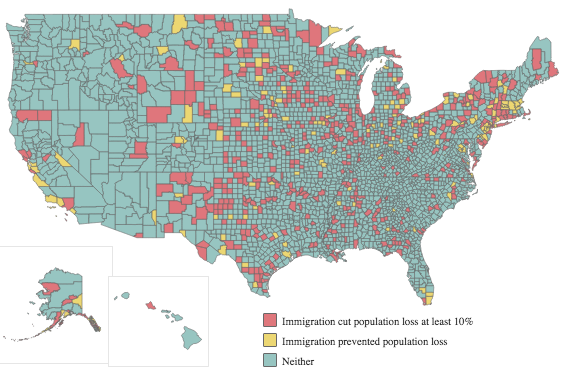 The population is so large in major cities that sometimes otherwise very red states are tipped blue because rural areas have far less population density than cities. Cases of HIV/AIDS are mostly concentrated in urban centers, but as the disease moves out into rural areas, educational and medical resources for preventing and treating it are left behind. In Florida, a State Healthcare Access Research Project report on HIV/AIDS in rural North Florida reveals trends found in rural places across the country. Between Gainesville and the state border with Georgia, there are more than 1,500 AIDS patients and more than 2,617 HIV patients, according to the report. Men with AIDS outnumber women 4 to 1, and they are disproportionately African-American. "A lot of the challenges here are similar to what you find in other Southern states, with a rural population and pretty pervasive stigma," Amy Rosenberg, associate director of the Center for Health Law and Policy Innovation at Harvard Law School, told Kristine Crane of The Gainesville Sun. Buried in Congressional talks about the "fiscal cliff" are "important Medicare provisions that could make the difference in whether many rural hospitals in Texas can keep their doors open," Don McBeath of the Texas Organization of Rural and Community Hospitals writes for the Austin American-Statesmen. The Medicare provisions would affect rural hospitals across the country. Congress changed how hospitals are paid by Medicare in the 1980s to a more "standardized and averaged payment methodology," known as the prospective payment system, McBeath writes. Previously, Medicare paid for cost of services in individual hospitals. That system catered more to urban, high volume hospitals and didn't consider the unique ways in which rural hospitals operate, McBeath says. "They often have a narrower financial margin than urban hospitals. Few rural hospitals provide more profitable advanced services and medical procedures to offset losses in other areas such as emergency care." Operating costs in rural hospitals can be slightly higher in general because of low patient volume, swings in patient numbers, and difficulty in staff recruitment which can increase payroll costs. Congress tried to address these issues in several ways, McBeath writes. It was decided that spending a little more was worth it to keep rural hospitals open, so programs like Critical Access Hospitals and Sole Community Hospital designations were created to give small, low volume hospitals more in Medicare payments. Research results could influence industry standards and state regulations, Boehnke reports. "We have the ability to do this in a controlled manner, controlled science, where it will be peer-reviewed and it can be trusted. That's why we believe we need to weigh in here," said UT Institute of Agriculture director Larry Arrington. There's a clause in the contract that would allow UT researchers to "pull the plug if anything goes wrong," he said.